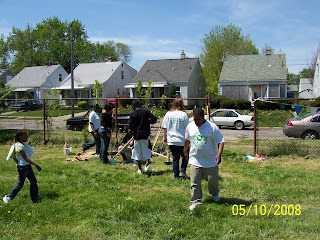 The Warrendale Community Garden will break ground this Friday, May 16th, at 8:00 am. The garden is located in the Lloyd H. Ryan Playground, (Kirkwood between Faust and Greenview). Everyone is invited to attend this 30-minute event. The next garden work day will be on Saturday, May 17th from 9am-3pm. They will prepare the 30 x 30 garden bed to plant vegetables and hopefully making a wheelchair raised bed for our senior community members. The produce grown in the garden will be for the families that garden with us, donation to the local food bank and selling out produce at the Eastern Market downtown. For more information, please feel free to contact the garden's coordinator Carla Thomas at 313.784.8804.